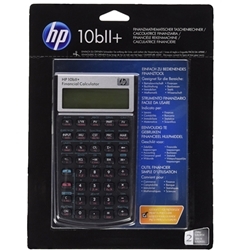 The HP 10BII+ Financial Calculator features over 100 built-in functions for business, finance, mathematics, and statistics, the 10BII is an ideal calculator for business students who want to get ahead. Calculate loan payments, interest rates, amortization, discounted cash-flow analyses, TVM (loans, savings, and leasing), and more. Statistical analysis is cumulative, and you can figure standard deviation, mean, and weighted mean in addition to forecasts and the correlation coefficient. Cash-flow analysis is register based and has 15 functions. The HP 10BII business calculator has an algebraic entry system and a logical and intuitive keyboard layout with easy-to-read labels. The LCD screen features up to 12 characters on one line of text. Small and sturdy, this calculator is easy to slip into your backpack or briefcase and bring to class or your workplace. HP offers a one-year warranty on the 10BII.